Linda Redmann gives back to her home state through a gift in her will. Though she may have spent the better part of her adult years away from the state, North Dakota was always in Linda Redmann’s blood. “She’d been away from North Dakota for quite a while, but she always remembered her roots,” said Mark Hall, a longtime friend and trust advisor to Linda. Born in Illinois, Linda was raised on a farm near Crystal, N.D., and graduated from the University of North Dakota with a degree in home economics in 1967. After pursuing educational and professional opportunities in Wisconsin, Arizona, and South Carolina, it was her desire to remember those North Dakota roots, even in her passing. Once she had earned a master’s and a Ph.D. from the University of Arizona, Linda’s career as a teacher began at the North Dakota School for the Blind. 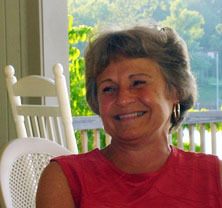 Following stints at the Wisconsin School for Technical, Vocational, and Adult Education; the University of Arizona; and the University of South Carolina, she eventually landed at Clemson as an Extension Residential Housing Specialist. Linda retired from Clemson as Professor Emerita of Family and Youth Development, but remained in Seneca, S.C. In 2012, Linda was diagnosed with a terminal brain tumor. She asked Hall and his colleague Claire Herland to travel to Seneca to help her get her affairs in order. “We reviewed some ideas and she basically said to us, ‘Help me coordinate my philanthropy,’” Hall said. Included in Linda’s plans of where to direct her funds was a gift through her trust of $617,000 to UND’s School of Medicine and Health Sciences to be used for research in the areas of cancer, rural health, and consumer health. Cancer and rural health were both issues that were personal to her, but her willingness to make a difference in consumer health stemmed from her professional background. As a tribute to Linda and her wonderful gift, the UND SMHS will name the Linda L. Redmann Pathology Research Lab in the new building. Linda gave to a number of other charities as well, not only in North Dakota, but also South Carolina, Georgia, and Arizona. Over the years, students at the University of North Dakota have benefited immensely thanks to thoughtful planning done by alumni and friends of UND like Linda Redmann. Please contact a member of our development team for information about how you can leave a gift in your will, to discuss how you would want your gift to specifically benefit a program of your choice, or any other questions you may have about how to leave your legacy at the University of North Dakota.